I had a delightfully weird time seeing music a couple of weeks ago at the Black Box Theatre. There were a ton of cool shows happening that night, but his one seemed too odd not to check out. I wandered downtown and found the path along Battery street and took it to the theater. I was a bit on the early side and they had the atrium open, but the theater was still closed. I sat on a bench at the edge of the room and listened as two of the guys from Superhuman Happiness played synths and Zach from Arc Iris sat at the piano and jammed for an hour or so. As the room slowly began to fill, masked mimes flooded in and plied us with tasty food. I got a drink and chatted with a bunch of cool people but was mostly lost in the endless playful musical jam. At one point, someone tapped Zach on the shoulder and grabbed part of the keyboard and began to play. Zach stepped away, and I think it was Henry Finch who was now playing the grand piano solo. The theater doors opened and a few people began pushing the piano, with Henry, into the main room. They pushed him to the front of the stage and the band joined in. The Capacity Ensemble. featured several singers, cello, clarinet, drums, and Henry on piano and began playing crazy fiery jazz. They played a song with a gypsy feel, then a rocker, then followed it with a tea ceremony song. A soulful bluesy rocker featured a lyric about say, say my name. They followed with a cool song with a huge piano sound then eased off for a bluesy rocker to end their set. It was really fun. I wandered around the dreamy room for a bit and watched people enter the tiny room where the giant head dispensed futures or advice or something. I wandered across the room, and in one of the corners, visible behind silk curtains, Ouzkxqlzn used a wrench to elicit weirdly beautiful noises from her guitar. She is so amazing. After a bit, a hooded figure took the main stage and began singing and playing guitar. The people at the front of the stage sat in a semicircle which created a mini theater in the theater. Brad Barr began with a Jimmy Page standing on a mountain calling powerful forces vibe, then settled into a lovely countryish instrumental. He followed with a slow and moody song on electric guitar which encouraged us to close our eyes and take his hand. He followed with a really sweet song on acoustic and wrapped up on electric with a deep song about how death transforms us. It was a stunning set. I zipped back to the corner for a bit and let Ouzkxqlzn’s music wash around me. I hung out for a bit before several of the evening’s hosts began moving the crowd back to the atrium. We hung out there until the doors opened with a slight reworking of the room. A sax and trumpet player lead us back in then Lee Anderson got up to speak about his love for our community. He then introduced Arc Iris, who set a cool tone as Jocie emerged from the box on the stage. They jammed out a heavy dancey set that had an almost industrial feel. Jocie wandered into the crowd for one beautiful dreamy song then they followed with one that had an electronic Mimi on the Beach vibe. They rocked out one more song then called it a night. At some point the piano had been moved to the middle of the theater room. Zach moved from the stage and sat at the piano and began to play. He’s so talented, I could listen to him play forever. After he wrapped up, Superhuman Happiness kicked out some heavy dance grooves and kept the party going. Puppets wandered the room. People got into the roller ball and rolled around the room. Lots or people just danced to the beats and smiles were everywhere. At some point Brad and the Arc trio joined SH and locked into a fun jam. They played for a while then reconfigured back to the Superhuman duo. I hung out for a while, but as it got late, I headed out the door. The walk home was lovely and my dreams that night weren’t anywhere near as fun as that dreamy show. I had a great time seeing music last Saturday at Signal Kitchen. The evening began with a puff of smoke and a trance music flow supplied by Snakefoot. He moved a lot of cool sounds in and out of the flow and was joined by Stephanie Heaghney. She added bits of voice and flute into the samples that created the sound. She sang a little now and then and that was lovely to hear. There were no separate songs as such, just a steady transition of sounds. It was pretty cool. Clad in white jumpsuits and wearing head lamps, Superhuman Happiness took the stage for a very rhythmic dance party. The room was pretty full and people were happy and having a great time. They were joined by a percussionist, who’s name I missed, perhaps Eric, and Ray Belli from Arc Iris sat in on the main drum kit. The three main members of the band played keys and horns and Andrea Diaz’s singing was lovely. The only song I knew was See Me On My Way, and they did a great job on it. They played for an hour or so and the crowd danced the whole time. Ryan Miller sat in on DJ before and after the Happiness set and played some great songs. I don’t think I knew any of them, but they all seemed to have a familiar ’70’s feel. At some point, three golden caped figures emerged from the back of the room and rushed to the stage. They knelt before it and activated the Arc Iris sign, then took the stage and began to play. The trio sounded great and mixed a dance sound with some lovely melodies. They played fun and gorgeous songs like Paint With The Sun and Johnny. They reworked Money Gnomes from the first album. They played a couple of the songs from Joni Mitchell’s Blue album, since last time they were in town, they played the whole thing. They did an instrumental jam where the angel wings came out and followed with a powerful version of Kaleidoscope. Their set was fantastic and they ended the night with a well deserved lullaby encore. I’m so glad I went. Tonight’s local music radio show on 107.1FM WBKM will go as follows. From our small city to the great big world, these are the Sounds Of Burlington. Thanks Higher Ground for sponsoring our station. They have a lot of music happening this week, and so does the rest of our town. Let’s begin with a guy who played around in the 1990’s and is getting the band back together. On Monday Kochalka, Dino, Swale and Led Loco played a show in honor of Mike McGonegal. It was a great send off and most of those songs were played. He will be missed. OK, here is the next song on the album I’m playing all the way through week after week. The album is called Song For My Double. Iris will be at Signal Kitchen on Friday and always put on a great show. That’s another new song from Madaila from their Traces album. 1881 are playing Sidebar on Monday and are really good. This next band are playing with Iris on Saturday. Great new song from Whisper. Who needs contests when you can just walk out to a local club and see people like Jeremy. Haley and the band will be at Nectar’s tomorrow and always put on an enthralling show. This next singer will be at Manhattan Pizza on Saturday. I still remember the show Grand played at Nectar’s a few months ago and can’t wait to see them again. Bees are playing next Wednesday at ArtsRiot. Admiral are at the Monkey House on Saturday and always rock. OK, let’s play some classic Burlington songs. 20.) The Spy Song – Pinhead. All four of those are classic Burlington songs. This next one is too and is unfortunately still all too appropriate. Those are all classics too. Barbacoa will play with Swale tomorrow at ArtsRiot for a live recording, so that is one of the many can’t miss shows tomorrow, and Saturday is just as packed. OK, let’s keep rocking. Great new Siberians song. FTC rocked the early 2000’s and Casey used to sing in a few local bands. I hope you enjoyed checking out the music of our town. Let’s do it again next week, shall we? From our small city to the great big world, these are the Sounds Of Burlington. I have been so inspired by Bernie’s valiant run for President. No matter what happens next, he has gotten his message out to the people in staggering ways. He has inspired people in ways that we will not understand for years, but we do have some music that has been inspired by his highest ideals. Let’s begin tonight with some of those. His message is so wonderfully inspiring and I’m glad he has the chance to spread it to so many people. OK, here is the last song on Callisto. I will have to pick a new album to play all the way through next week. Soule will play around at Jazzfest. I had to play Violet since the Sneakers band are so great. What a lovely way to end the Callisto album. OK, Soule are also playing a few shows with Josh Weinstein and Bob Wagner at Nectar’s as Soule Indomitable so let’s play a Kat Wright song. I really enjoyed the Connor show with the Felice Brothers at Higher Ground last Tuesday and wanted to play some of their music. Great song by Kat and the band. On Monday I got to see a cool band called Silver Bridget. I don’t have any of their music to play but they did a great version of this next song. This next song is a cover of a classic as performed by a band who will play the top of the block on Church St on Friday Night. Castles played a new bar called Side Bar on Wednesday. I should check that place out soon. Barika and Superhuman will be playing around this weekend. Great cover from Madaila. This next band played at Higher Ground last Sunday. I’m psyched to see Rabbit on Saturday at Four Quarters Brewery in Winooski. The Breaks will play in Nectar’s garage window on Saturday and on Church St on Sunday. Barbacoa are playing at The Skinny Pancake on Saturday. This next band will feature some bass playing at Manhattan Pizza and Pub on Saturday. I got to chat with Urian Hackney who said the new Francis album should be out around Labor Day. Woo hoo!! Great new song from Particles. Phantom played The Monkey House on Wednesday. This next song is a personal favorite. 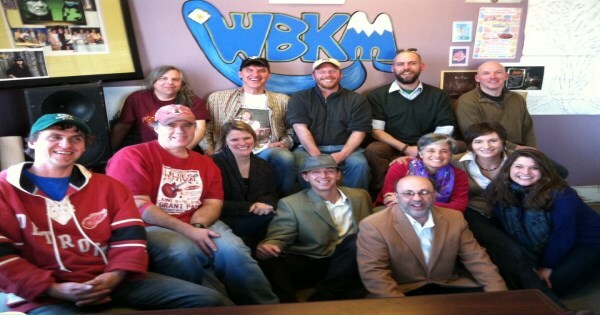 I just got back from my local music radio show on Wbkm Dot Org. I had one stunning mix and played some sweet songs. From our small city to the great big world, these are the Sounds Of Burlington. I’ve been thinking about eternity and the nature of what we are recently. It’s weird to think of the spirit that is you is so tied to a physical body, and that large wonderful body would be almost nothing if you took away the water. Let’s play some songs about water and think about what it means to be alive. This is Left One In The Rain by Alice Austin on WBKM and this is Burlington’s Kind Of Music. Great song from Vedora. Matt has a side project every Monday in February at Radio Bean from 7-8. Last week I worked until 7:30 and missed it. Rats. Great classic songs from Burlington’s past with Joe and Zoot, and great song from Burlington’s present by Joe. This next singer is playing the Bean on Saturday at 7. I’ll see if I can make it if I get out early enough. Rusty are from North Hampton but come to Burlington often. They are playing the Skinny Pancake on Friday. Cool song from Brett Hughes and co. The Anna song would have fit nicely into the first set. This next band is playing The Monkey House tomorrow. Great band name and sweet song. Hover were a ’90’s Burlington band. It’s almost time for the And The Kids new album and tour. If you liked the Hover song, you’ll like this next set too! That song used to rock Burlington hard and often. I love all of those rocking songs that helped Burlington to keep expanding the sound of our town. I’m very psyched for this show next week at the Flynn Theatre. These three bands will be rocking out. I’m sending that set out to my brother Ken who will go to the show with me. OK, let’s head back to classic Burlington. Ending where we began, on the edge of sea and sand. Ken and I, and most of the elephants, will see the lights of Montreal this summer when we go see Rush. I hope you enjoyed checking out the music of our town. Let’s do it again next week, shall we? I just got back from my local music radio show on internet only WBKM,ORG. It’s Jazzfest week, so I highlighted some of our great local jazzish music. From our small city to the great big world, these are the Sounds of Burlington. It’s Jazzfest week and there were 4 bands playing on Church street when I walked down, and there’s music in every club in town. With all the flowers out, every time I step outside, it just feels great to breathe! Here’s Rubblebucket on WBKM, and this is Burlington’s kind of music. Kat has a great voice and is a true local treasure. She and the band play Radio Bean all the time. That Barika song makes me happy whenever I hear it. Rubblebucket used to play all over Burlington. The last show I went to was Marco Benevento at Radio Bean. The show was recorded and uploaded so I downloaded it. Here’s one of the songs from that show. Zoot is a legend in this town and I love the sting in the guitar. Superhuman have a great name, and the song makes me smile as much as their name. Killer playing by Marco. Up next let’s rock for a bit. Here is the next song from Dancing With The Big Guy. That song just fills me. Dented have changed their name to Better Things and are playing Sunday at Twofourtwo Main with Gorgon. Great song by Ninja. Let’s go back to some more fun with Marco. Great playing by Belizebeha, even if it’s a bit outside of my comfort zone. I do try and push myself a bit for Jazzfest week. I hope you enjoyed checking out the music of our town. Let’s do it again next week, shall we? At the end of the show, Ted Jacobites stopped in and gave me a ride home on the rainy night where I did not bring my umbrella. He asked for a song by Corrinne Bailey Rae.